The Architectural Research European Network Association – ARENA, the European Association for Architectural Education – EAAE and the European League of Institutes of the Arts – ELIA are together seeking to offer a joint platform for research in all fields of architecture, design and arts. This also includes subjects such as environmental design, sustainable development, interior design, landscape architecture, urban design/urbanism, music, performing arts, visual arts, product design, social design, interaction design, etc. One of the objectives in doing so is to support early-career researchers and PhD students in the fields of architecture and the arts to improve the quality of their research. Another objective is to show that senior researchers CARE about the work that is being done by more junior researchers. 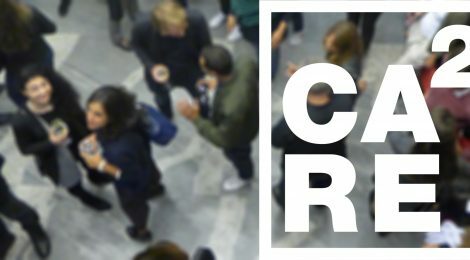 CA²RE, the Conference for Artistic and Architectural (Doctoral) Research, proceeds from the previous ARM (Architectural Research Moments) symposia, with a flavour of the PRS (Practice Research Symposium). The aim is to create an international event at which early-career researchers, doctoral students and post-docs can present their research project to experienced researchers and have their work discussed by international panels in these diverse fields. It represents an open and inclusive follow-up of the ADAPT-r project (Architecture, Design and Art Practice Training-research / EU ITN). ‘Open’ means an open call for participation and ‘inclusive’ indicates that it is not limited to s single research approach (practice based exclusively, or by/though design exclusively….or theory focused exclusively). It embraces all the contemporary hybridity of research in arts, design and architecture. On the other hand it seeks for what is in the core of artistic and architectural research. Zooming in and out is not as simple as it seems – it needs a direction. The CA²RE conference provides an international discussion platform of where we want to go with this zooming and how can we CARE for each other in our endeavours. CA²RE is intended to bring together senior staff and early-career researchers to improve research quality through intensive peer reviewing at key intermediate stages. It wishes to contribute to the open and diverse field that exists in architectural and artistic research, not giving any priority to any single approach. The conference will support established research methods, but especially welcomes new and emerging fields such as research by design and through artistic/creative practice. The event aims to stimulate researchers to interact mutually and benefit from participating in two-way discussions, whatever the stage of their research. Above all, CA²RE wishes to offer a lively, diverse and inclusive environment that brings together young researchers within a multi-disciplinary setting. CA²RE conferences typically take place over a weekend. The selected participants will present their PhD research for 30 minutes each, which will then be discussed and peer-reviewed by an international panel (composed of senior researchers and post-docs) for another 30 minutes. The presentations can include the now traditional formats such as Powerpoint, Prezi, etc., but the organisers particularly welcome other kinds of contributions such as exhibitions, performances, etc. Depending on the number of participants selected, parallel sessions and post-doc tracks will be organised as necessary. It is preferable that all participants attend the full weekend as conferences are framed as collective experiences of learning and networking. During its initial development stage the CA²RE community enjoys its freedom of informal movement through Europe, combining the continuous flows from the previous international PhD training actions with the local flavour of research traditions in artistic and architectural research. It represents a transversal connection in-between the three established European associations/networks, related to the artistic and architectural research and education: ARENA, EAAE and ELIA. For more information go to the CA²RE website hosted by the architecture faculty of the university of Ljubljana.